What is another word for Indicated? 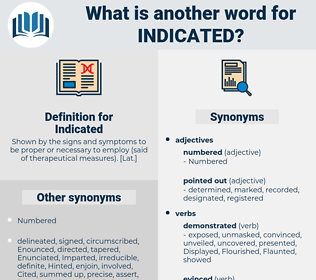 indicates, suggested, disclosed, noted, Stipulated, indicative, detailed, marked, indica, above-mentioned, observed, designated, appointed, referenced, prescribed, Targeted, aforementioned, above, Expressing, informed, scheduled, pointed, specified, advisable, express, suitable, intended, alleged. indications, directions, designations, specifications, markings, particulars, Respondents, documents, pointers, insights. demonstrated, incorporate, delineated, Denoted, Insinuated, Reiterated, integrate, integrating, indicator, Cited, Attributed, characterized, indicators, contained, Containing, included, estimated, Contended, Communicated, attest, attested, Participated, confirmed, appreciated, Explained, revealed, statistics, articulated, acknowledged, note, Testified, Cautioned, reflected, signified, signify, detected, predicted, Enumerated, appropriated, donated, Created, represented, Introduced, determined, reminded, Ceased, Indicted, investigation, emphasise, emphasised, Existed, Contributed, Alluded, Told, subsequent, Intimated, description, implied, clarify, clarifying, clarified, notice, noticed, notices, Manifested, detail, details, traces, outlined, Hinted, involved, emphasize, emphasized, conclude, concluded, reaffirmed, elaborated, recognise, recognised, asserted, allocated, advised, underline, underlined, Signaled, signalled, footnote, credited, considered, Appeared, extended, Incurred, sustained, references, Insisted, reference, directed, established, afterwards, recommended, Wrote, discovered, proved, Stating, underscored, reservation, estonia, read, displays, increased, Seemed, Rated, announced, perceived, recognized, i.e., understood, Warned, conceded, defined, ended, transmitted, Quoted, alerted, reacted, add, respond, Responded, added, Complained, accepted, pinpointed, taught, Exemplified, affirm, affirmed, criticized, classified, Assessed, recalled, highlight, highlighted, admitted, Brandished, Benefited, precised, Notified, Transpired, point, verified, verify, inscribed, reinforced, maintained, gathered, threatened, dated, assumed, addressed, repeated, Commended, expanded, comments, proclaimed, collected, Enabled, conferred, contrary, sent, bore, Heeded, led, Yielded, recounted, realized, ignored, found, exhibit, exhibits, Them, Forwarded, stressed, responses, continued, outcomes, namely, expressed, advice, regained, Claimed, decided, said, learned, Promoted, featured, check, checked, Answered, Deemed, pledged, uncovered, earned, Issued, moved, testing, Tests, outcome, clauses, Emerged, Wondered, sign, signed, signs, Delivered, Exhibited, tables, Echoed, Gestures, felt, Helped, ordered, branded, presented, Towards, registered, staged, Believed, pronounced, ranked, Regarded, table, tabled, developed, elements, Brought, according, assured, articles, Launched, Was, Were, Resulted, results, Voted, Dealt, conducted, Ranged, Occurred, Supplemented, Enshrined, Filed, headed, inquiry, relayed, left, Argued, drew, Discussed, turned, agreed, Returned, Urged, proposed, survey, Protested, know, Knew, prepared, used, Offered, thought, Prompted, Gave, Reached, decreed, Remarked, Chose, responsible, knowledge, Wore, supported, briefed, clause, surprised, Upheld, raised, Replied, voiced, spoke, posed, Became, Praised, status, called, touched, unveiled, rule, Termed, Had, ruled, Flagged, Came, applied, produced, received, Expounded, Caused, Leaked, entrusted, enrolled, Asked, Took, Hoped, opinions, Marched, Accounted, Than, promised, Threw, sought, conjecture, waving, Waved, waves, Served, desired, Meant, wanted, Allowed, broke, owned, Supplied, view, Viewed, heard, hearing, exposed, released, opinion, under, Those, saw, mirrored, held, Met, to, remembered, Wished, son, placed, posted, focused, relieved, requested, shared, OJ, Scored, Vowed, Resumed, formed, Talked, Which, 'd, Went, figure, figured, Looked, Got, tried, Did, names, named, made, suggested, identifying, disclosed, noted, Stipulated, Specifying, described, marked, Provided, observed, insert, Inserted, designated, appointed, referenced, Targeted, informed, list, lists, pointed, specified, completed, intended, alleged. 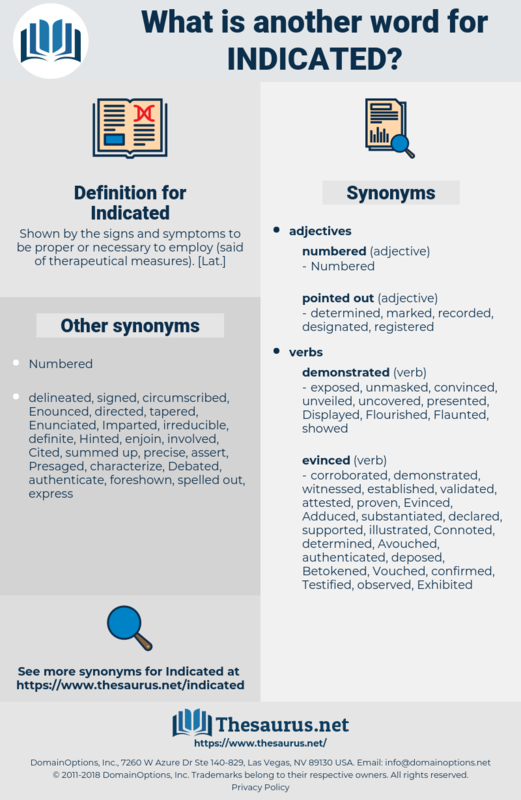 demonstrated, incorporated, delineated, substantiated, Denoted, dictated, ascertained, demarcated, Cited, Attributed, characterized, Denominated, evidenced, contained, included, calculated, Disseminated, instructions, estimated, Inferred, Contended, Communicated, attested, characterised, information, accredited, Contemplated, depicted, confirmed, Enunciated, Explained, Translated, Inventoried, Generated, revealed, located, articulated, dedicated, acknowledged, note, Indexed, predetermined, reflected, distinguished, ventilated, Advocated, implicated, Annotated, signified, detected, predicted, Enumerated, appropriated, disaggregated, Replicated, donated, related, certified, Created, represented, Introduced, determined, reminded, invited, emphasised, Existed, Contributed, Told, Intimated, instructed, implied, clarified, mandated, notice, noticed, Manifested, outlined, Hinted, preferred, involved, emphasized, concluded, advanced, reaffirmed, elaborated, recognised, asserted, allocated, advised, underlined, Signaled, signalled, implemented, witnessed, cancelled, credited, considered, Appeared, extended, Influenced, Incurred, sustained, Insisted, reference, directed, established, written, condemned, proven, recommended, Administered, discovered, proved, underscored, disputed, read, increased, Rendered, measured, Rated, announced, delimited, perceived, sanctioned, recognized, understood, convention, Warned, defined, predefined, amended, inspired, transmitted, documented, Quoted, regulated, Symbolized, Responded, added, Obtained, accepted, pinpointed, combined, taught, labeled, statement, Exemplified, affirmed, criticized, formulated, executed, classified, restricted, Assessed, recalled, highlighted, attached, Examined, Benefited, Notified, Transpired, verified, latitude, inscribed, forecast, forecasted, maintained, Demanded, Denounced, gathered, altered, dated, compliance, addressed, repeated, summarised, deducted, warranted, collected, Enabled, accompanied, memorandum, abandoned, sent, N, led, Yielded, embodied, found, Emitted, Forwarded, catalogued, stressed, responses, Compiled, expressed, Betrayed, advice, regained, governed, evoked, Claimed, needed, decided, said, heralded, justified, learned, Learnt, enclosed, Promoted, featured, accomplished, Captured, utilized, checked, Answered, Deemed, experienced, pledged, permitted, publicized, Arisen, uncovered, satisfied, Issued, qualified, moved, printed, committed, itemized, Emerged, foreseen, furnished, contested, Achieved, signed, Delivered, Exhibited, Ticked, diagram, Echoed, angel, Consigned, felt, treated, Helped, valued, ordered, refined, presented, affixed, impacted, filled, registered, aware, Managed, Believed, elected, pronounced, ranked, Regarded, table, tabled, developed, prohibited, Aimed, spelled, designed, Brought, assured, Undertaken, laid, Launched, Resulted, Voted, Dealt, conducted, adopted, Occurred, drawn, Enshrined, Filed, left, endorsed, Argued, Discussed, agreed, reduced, Returned, Urged, organized, proposed, chosen, Encountered, cast, Protested, Happened, aired, prepared, used, Offered, Been, stamped, thought, Prompted, Followed, Reached, fulfilled, Judged, supported, briefed, spoken, become, Upheld, compounded, settled, approved, saved, published, equipped, raised, changes, professed, Replied, voiced, come, vested, status, called, touched, favourable, ten, Grounded, Termed, built, Had, Earmarked, ruled, supposed, Flagged, applied, produced, received, taken, Deported, Caused, budgeted, enrolled, Asked, fixed, opted, stored, Accounted, promised, tagged, sought, member, Served, Singled, Exported, desired, attempted, Expelled, positioned, Meant, lost, grouped, Allowed, typed, us, Supplied, Subjected, Viewed, response, charged, reviewed, bounded, obliged, heard, armed, exposed, Lived, released, opinion, locked, seen, kept, held, Met, remembered, controlled, Performed, placed, imposed, posted, pursued, focused, relieved, requested, shared, eye, Scored, Resumed, Talked, suited, billed, Got, tried, Numbered, S, done, based, 1996, named, made, suggested, disclosed, noted, Stipulated, described, detailed, marked, Provided, observed, Inserted, designated, appointed, referenced, prescribed, Targeted, informed, scheduled, pointed, specified, completed, intended, alleged. Her clock indicated a little past midnight. He was dead, the manner of his death clearly indicated.